Erin Wiersma making a drawing on the Konza Prairie in Kansas. Since her last residency at Two Coats HQ in DUMBO, Erin Wiersma has discovered the Konza Prairie, a biological research station jointly owned and maintained by The Nature Conservancy and Kansas State University. 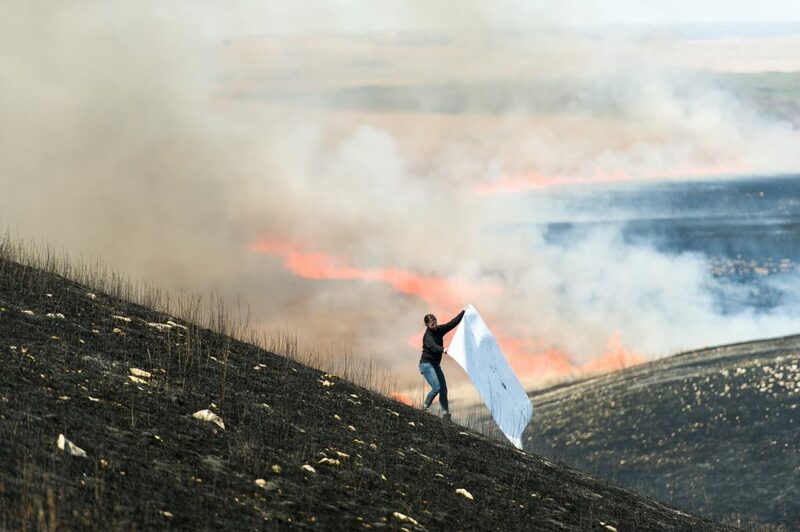 Wiersma uses the bio-char from controlled burns of prairie tallgrass to create large drawings on site. 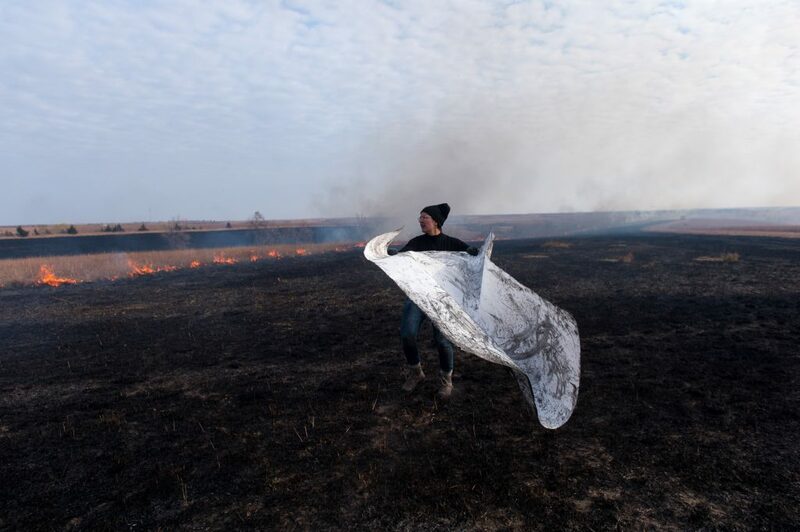 Traversing the scorched landscape, which is off limits to the general public, she locates darkly burned places to make her work. “It’s like a dance performance – I’m trying to find the wind and the exact moment when I lower and lift the paper onto the land to make the rubbings.” She keeps the process improvisational and experimental, recording her experience in 30-foot drawings that resemble huge etchings. Wiersma will be in residence at the Two Coats of Paint studio from December 11 through 17, and she will have several of the Konza Prairie drawings on display during the Open Studio on Thursday, December 14. Please stop by, check out her work, and say hello. Two Coats of Paint Open Studio, featuring work by resident artist Erin Wiersma, 55 Washington Street, #321, Brooklyn, NY. Thursday, December 14, 6 – 9pm. Erin, I attended your artist talk at the beach museum and of course enjoyed the indispensable information about the Konza Prairie , good hearing you talk and thank you.